Today's outfit was chosen for no other reason but comfort! You know how some days you just need something comfortable? So here you have it. I've been wanting to pair a simple t-shirt with this dress for awhile now, so I took the opportunity to do that today. I also had some fun with Megan Mae Buttonflowers since it's been awhile since I've worn any. I added them to my belt and I think they add a fun pop of color against my plain white t-shirt. I took a close up down below. I've been noticing that while I still have light outside in the mornings, it's starting to change a bit. The angle of the sun isn't as high so it's making my pictures a little more challenging. I'm going to keep trying different spots in the yard though, it's too soon to give up outdoor pictures all together yet! It's been awhile since you've seen my kitties, so I have a couple of sleepy kitten pictures to share this morning. On the left we have Taylor the muffin cat and on the right we have Pippin the blob. Both looked so comfy, I really wanted to join them! I don't think they are all that sad that we are back to work, they like to be lazy! But when we're home they do hang out with us quite a bit. I'm sure we wore them out a bit while we were home so much those couple of days! Very cute. These shapes look good on you. And buttonflowers complete any outfit! I've been worried about the light as well, my photos were way better this summer because of it. I love your belt, it's so cute! Love your skirt and the detail on the belt is gorgeous! That is such a great idea about pairing the maxi dress with a shirt. I love detail with the flower buttons on your belt! i love the buttons on the belt idea! and yes, it's going to get harder and harder to get pics in. blerg winter!!! Gotta love a good, comfy maxi skirt. I'm always reaching for mine too when I need a casual day. And love that you added Megan's flowers to the outfit - super adorable! Cute and comfy looks are simply the best! I love the button belt, totally adorable. DIY Tutorial for your necklace perhaps? 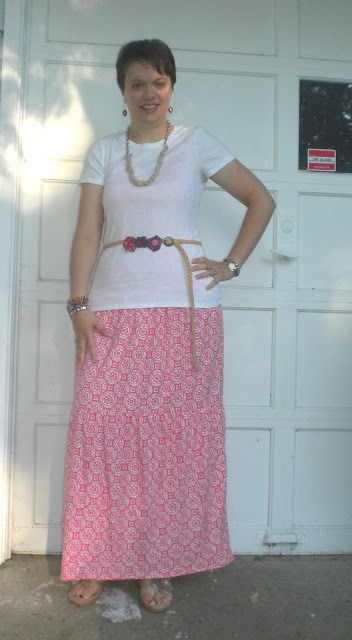 I love the shirt layered over your maxi dress--it totally works as a skirt too! And the button flowers are so cute on that belt! I love the belt! How cute with all the button flowers! Love the buttonflowers on the belt. It makes a good detail against the basic tee. I could totally curl up beside Pippin and sleep the day away! I love when kitties sleep on their face. It's so cute. Great look, Bethie! And I love how you dressed up the belt. So cute! I love the color of the maxi! And the flowers on the belt? ingenious! Aww the kitties! My babies are loving all the space at the new house, especially that they have stairs to run up and down! That button flower addition to the belt is genius, really adds a fun touch! Maxis really are perfection aren't they? They work for summer, fall, dressy, with T-shirts... Love this look! 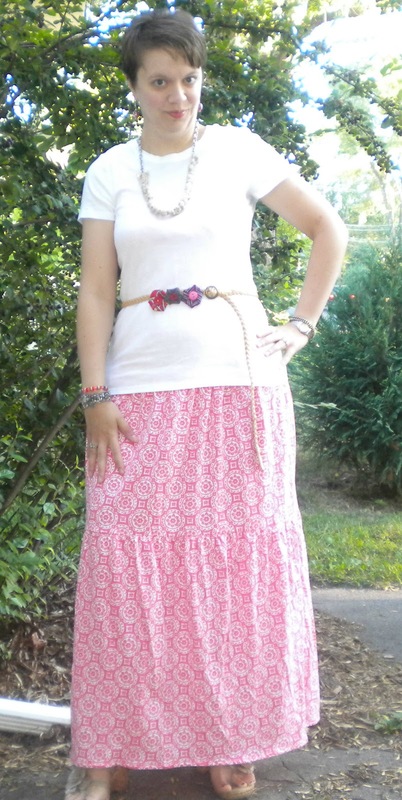 I love maxi skirts! I have been living in them and tank tops this summer since it's been so darn hot! I love this maxi :) Your belt really adds a special touch...very creative!